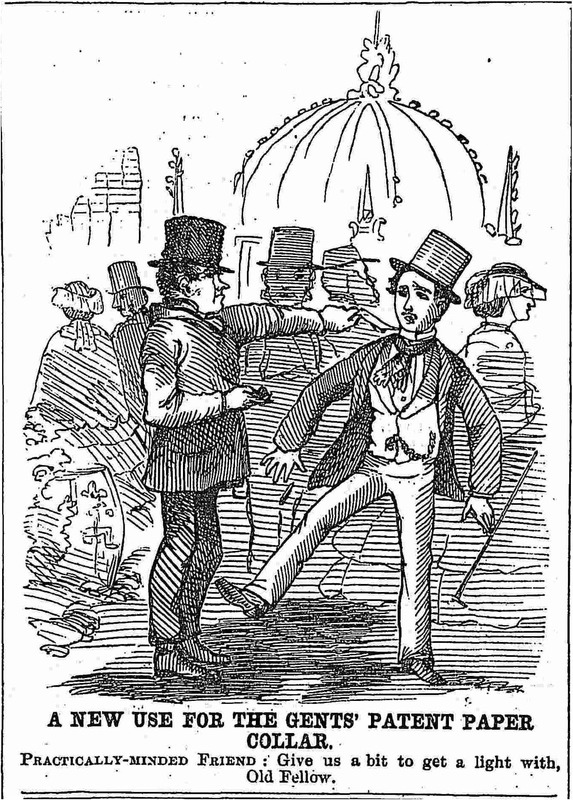 Cartoon, “A New Use for the Gents’ Patent Paper Collar,” Melbourne Punch, 15 April 1858. When paper clothing first arrived on the mass market, it had not yet hardened into a touchstone for class identity. Like Howard Paul in “The Age of Paper”, commentators recognized its potential usefulness, but they also felt awkward about replacing their fine linens with something so mundane and ephemeral. In 1858, a cartoon in Australia’s Melbourne Punch magazine showed one man tearing off a piece of another’s paper collar as tinder to light his pipe. Still, there were occasions for men of any class to think of wearing paper, as on business trips where laundry needs would impose a burden. Turf, Field, and Farm, a New York sporting journal for elite men, gave another reason: hired washerwomen—and sometimes even wives—were liable to perform their jobs badly, which in turn provoked bad tempers in the men. “We hate to swear,” the paper mused, “but do abhor badly washed linen.” It was a misogynistic thing to say, and probably tinged with nativism as well, for washing was job for immigrants. But it also shows an interest in paper that reached beyond clerks. In truth, housewives may have been equally eager to rid themselves of collar and cuff duty. In 1860, Godey’s Lady’s Book of Philadelphia included a puff piece on the novelty and convenience of paper, directing readers to William Lockwood’s shop on the fashionable Chestnut Street. Godey’s was a titan of its time, pricier than its competitors but unrivaled in circulation. Its iconic fashion plates made it an influential voice among upper-class and upwardly striving middle-class women alike—a voice that crossed over into menswear as well. What’s more, Andrews said, the man who wore such collars was of a particular type. In the North, he was usually a merchant’s clerk or the smalltime proprietor of a dry-goods store; in the South, he was a “country beau” who put on a clean shirt once a week to strut among the ladies. “He always has very sleek, greasy hair, carefully curled, and perfumed with cinnamon or bergamot,” she wrote, “and is much addicted to light kid-gloves, always a little soiled.” This was an old type, in fact. Dandies, and the habit of ridiculing them, dated back to the turn of the century. Often, critics focused on the unnatural pains they took to imitate their social betters. 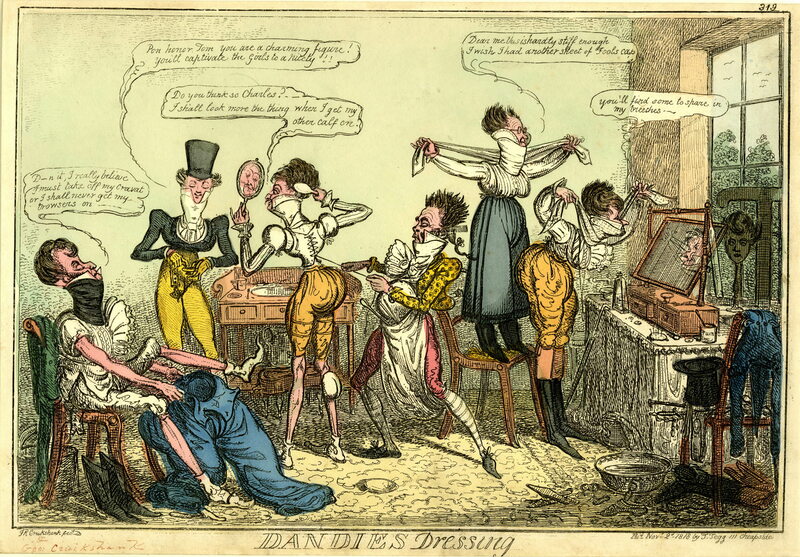 As Robert Cruikshank portrayed dandies in 1818, there were suffocating corsets and impossibly high collars. Later in the century, paper only added to the discomforts of vanity. Despite constant improvements, collar paper was rigid by nature and had edges that could irritate or cut the skin. In fact, when George Snow introduced cuffs with folded edges in 1869, he dubbed them “safety cuffs.” And so, in the eyes of detractors, the new “paper-collar gentility” was not only dishonest; it was foolish too. Nor was this the Times’s only allegation against disposable collars. There was also the problem of litter. Discarded collars reportedly lurked in the corners of boardinghouses, blew around backyards, and caught in women’s skirts. They blocked storm drains, and their muslin cores smoldered in fireplaces and gave wandering goats uptown a taste for clothes-lines. If cast into the river, the Times said, old collars would float along on the surface until landing on some other shore, which they would thus contaminate with their vulgar nature. All the while, paper collar makers went on marketing their products as respectable and sensible alternatives to starched linen—and millions of people bought them. For all the chatter about an unsavory class of young, urban clerks, disposable collars appeared just as much in rural towns by the last quarter of the century. In fact, one account suggests they were virtually the only kind of collar worn in those places. Outside of cities, frugality and respectability tended to merge, and the social scale was less diverse. 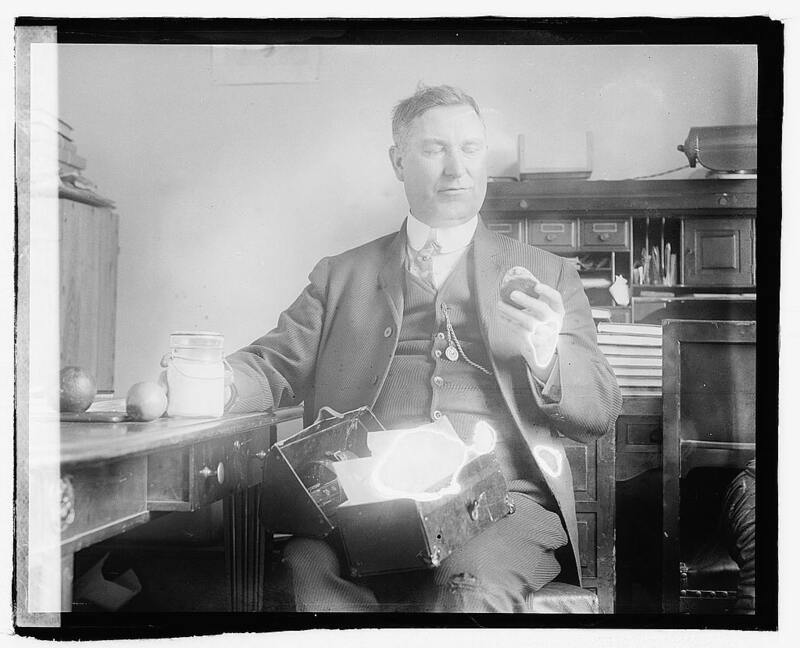 As late as 1920, Mississippi Congressman Percy Quin advertised a plan to beat the high cost of living: “Wear your old cloths, have them patched and darned, wear a celluloid collar, carry your lunch, etc.,” he urged his constituents. He even posed for a photo observing his own advice. 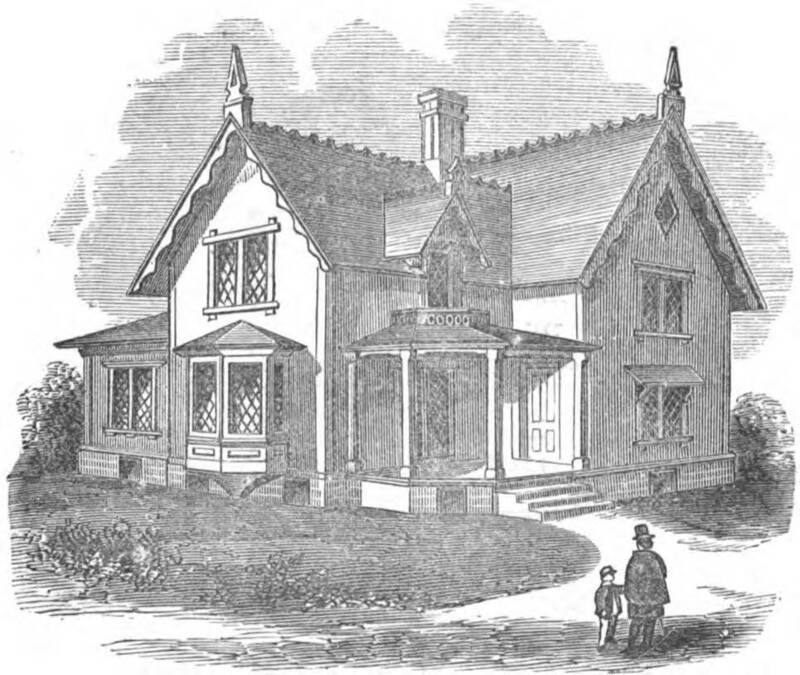 Illustration from Woodward’s Country Homes (1865), a design book for middle-class dwellings. A similar house appeared on packaging for the Narragansett Elmwood paper collar in the early 1870s. Like Woodward’s remarks on heating efficiency, the message from Narragansett was that cost-effective paper collars were a part of respectable middle-class life.